YARMOUTH — Scarborough coach Kerry Mariello was hoping a coincidence would be lucky. Skowhegan had won 11 state championships in the past 12 years, but the one loss in that time was to Scarborough at Yarmouth High School. The same two teams were back at Yarmouth High School on Saturday afternoon, and Mariello did witness a celebration. Unfortunately for her and the Red Storm, it was Skowhegan celebrating after a 4-1 victory in the Class A state field hockey final. Allison Lancaster and Rylie Blanchet scored in the first half for Skowhegan, and Renee Wright and Logan LeBlanc had goals in the second half. It was the 76th straight win for the Indians. Still, standards are high at Skowhegan, and both Lancaster and Indians coach Paula Doughty felt Skowhegan was stronger in a 1-0 victory over Messalonskee in the Eastern A final. Scarborough (16-1-1) began the game aggressive and clearly unshaken by Skowhegan’s winning streak and gaudy (128-3) goal differential. The Red Storm put the Indians back on their heels in the opening minutes, and nearly took the lead less than 30 seconds into the game. 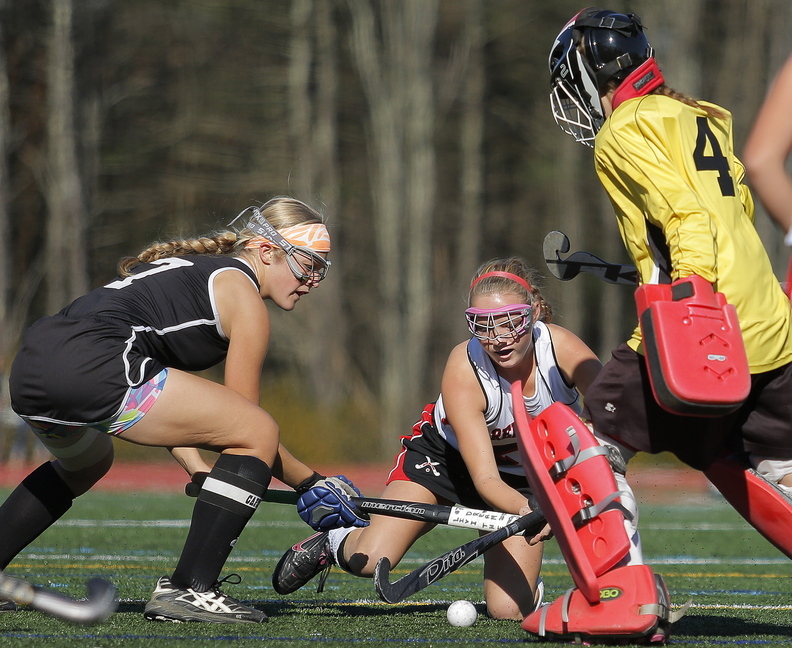 Kristen Murray had a strong shot, but Skowhegan back Tori Mullin kept her stick down and made a tough defensive save. Gradually, Skowhegan obtained control of the game and would not let go. 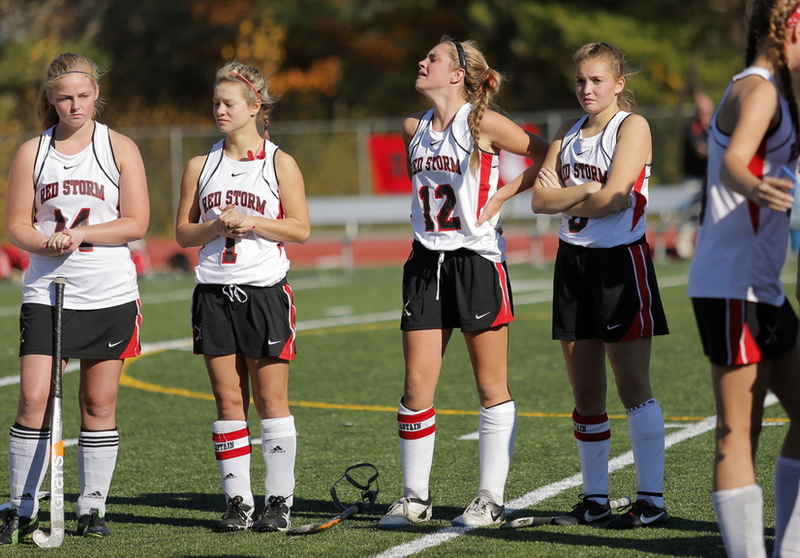 Doughty called an early timeout, and the Indians took a 1-0 lead when Lancaster basted in a shot off a penalty corner with 12:35 left in the first half. There was one anxious moment for the Indians, as Scarborough got two offensive players behind the defense in the circle for an instant, and Skowhegan goalie Leah Kruse had to make a save and kick the ball away. It looked like it would be 1-0 at the half, but Skowhegan earned a corner with about 2 1/2 minutes left. LeBlanc’s initial shot was stopped by Scarborough goalie Alyssa Souza, but Blanchet picked up the garbage on the right side and the Indians led 2-0. Even though the shots were 7-7 at the half, Skowhegan was clearly in control. Doughty is big on her teams not sitting on a lead, and the Indians charged out of the gate to open the second half. Skowhegan had three corners in the first six minutes, then scored with 22:19 to go. After a nice left-foot stomp save by Kruse on a penalty corner, Blanchet took off down the right side. Blanchet made a nice pass, and Wright ended up scoring for a 3-0 lead. Goal No. 4 for the Indians came less than six minutes later. On a penalty corner, LeBlanc swept the ball in, with assists from Blanchet and Mikayla Toth. Skowhegan scored on three of its 13 corners Saturday. “That’s a good percentage for anyone,” Doughty said. Murray scored with 11:02 left, after Skowhegan’s Holly Lupo made a defensive save to deny Abby Walker. The Red Storm did not get a penalty corner after their goal. Ultimately, you can call this game revenge for 2009, only none of the Skowhegan players were there. More accurately, it was the culmination of four spectacular years, when the Indians played 76 games, and won every single one.